Cloud forest is a special habitat and not just because the Resplendent Quetzal calls it home. Even if you don’t happen to be an eager birder creeping through misty forests with binoculars at the ready, it’s impossible to not be impressed, to feel a sense of wonder at walking through woods where massive trees are overloaded with lush vegetation on every branch, where hidden birds add to the mystery and imagination with natural minor-keyed flutes. Stuff grows on everything and life abounds. Look down and a millipede wanders over the detritus of the forest floor. Peer into the branches of the big trees and we might see the shapes of an Emerald Toucanet, tanagers, woodcreepers, and other birds doing their thing in the cloud forest life. 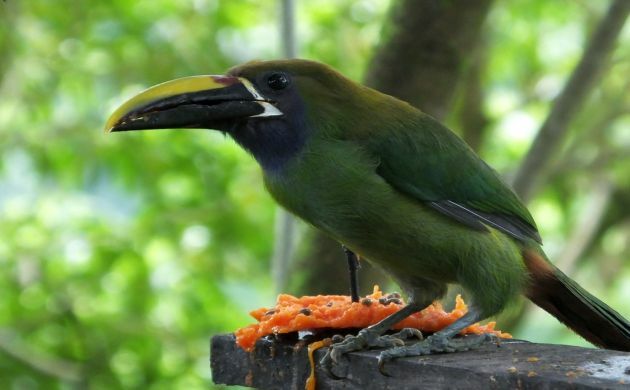 Northern Emerald Toucanets in Costa Rica are sometimes considered a separate species known as the Blue-throated Toucanet. This bad boy beauty isn’t even rare! Stop to listen in many a cloud forest on this side of the globe and we are also soothed and entertained by the songs of birds. We can expect to hear the cheerful rollicking notes of the Gray-breasted Wood-Wren, and in Costa Rica, the wren is joined by the chattering of Costa-Rican Warblers and the plaintive whistles of Collared Trogons while Black-faced Solitaires and Slaty-backed Nightingale-Thrushes compete for the prize given to the bird with the best song. The natural music of the forest is as pleasing a part of the overall picture as the verdant surroundings and scented, fresh, clean air. As with most forest birding, since we also hear far more birds in the low, foggy light of cloud forest than we actually see, being able to recognize the composers is an essential factor for any cloud forest bird count. I was reminded of that fact on June 23rd during the first official bird count at the Locos por el Bosque Reserve in Montserrat de Coronado, Costa Rica. 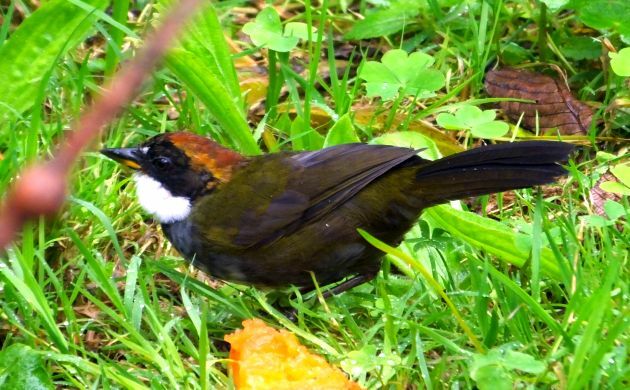 Located in the mountains that overlook crowded San Jose, this beautiful site acts as a welcome green escape for anyone interested in a cloud forest experience, and for the birder, you could hardly ask for more exciting birding so close to the capital. 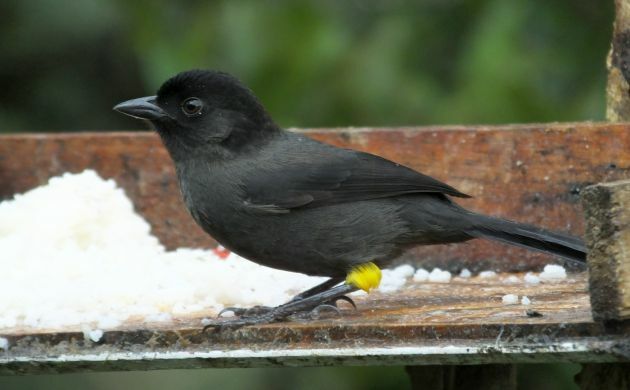 Yellow-thighed Finch, one of several common species in the forests of Coronado. I had only visited once before during a quick morning of guiding the Birding Club of Costa Rica and was impressed by the high number of uncommon species that occur at the site. These would be birds like the aforementioned quetzal, Black and white Becard, various Furnarids, and Ornate Hawk-Eagle. Not to mention, since the forests at Locos por el Bosque are also connected to the wild and extensive habitats of Braulio Carrillo National Park, there’s always a chance of something truly rare and unexpected showing up (such as a few years ago when either a juvenile Crested Eagle or a juvenile Harpy Eagle was seen!). With such possibilities in mind, myself and others were excited and eager to participate in this first count for the area. Organized by Wil Mendez and other folks at the Locos por el Bosque Reserve, and Margherita Bottazzi Basti of Armonia Natural, the count saw more than a dozen birders participating and was part of an ongoing trend to carry out summer bird counts in Costa Rica. It rained– This year is especially wet and we experienced a fair bit of that during the count. But, on a dry note, unlike so many other counts in Costa Rica, it did not rain the entire time! In fact, we had good weather for the morning of the count, good here meaning clouds, mist, but no pouring rain. However, it did pour all night long and although it made for a beautiful chorus of amphibians, the falling water knocked out our chances at vocalizing owls and nightjars. It can be pretty cool at night in the cloud forest– The damp weather also made for decidedly cool weather, especially during the evening hours. Outside of counting time, all participants were sort of huddled inside, sometimes near a wood burning stove. That was alright though because it was a nice change from sweating it up in lowland rainforest. That’s also what’s nice about Costa Rica; sweat in the lowlands while watching macaws fly around, and then cool off in the mountains the next day with Prong-billed Barbets. Prong-billed Barbets are cool weather birds restricted to Costa Rica and western Panama. Birds still made an appearance- Despite cool weather and some rain, the birds still sang and some also came out to play. There are a lot up there in Coronado too! Our best may have been Barred Becards, Collared Trogons, and Barred Parakeets that vocalized while zipping through the clouds. 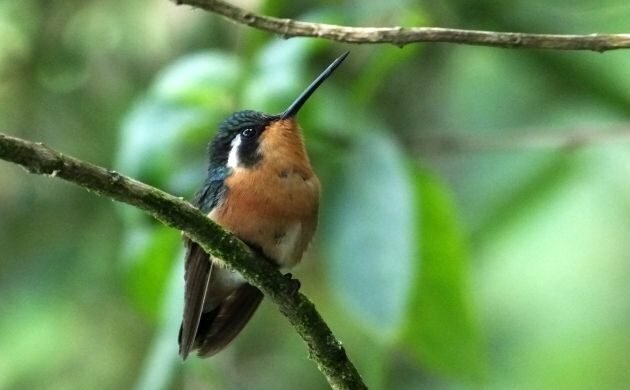 The vicinity of the Armonia Natural Lodge was good– Brown-capped Vireo and various species called from the surrounding vegetation, Slaty Flowerpiercer pierced flowers, and a beautiful Purple-throated Mountain-gem (the hummingbird at the top of the page) chased the other hummingbirds away. Some birds also came to the feeder. 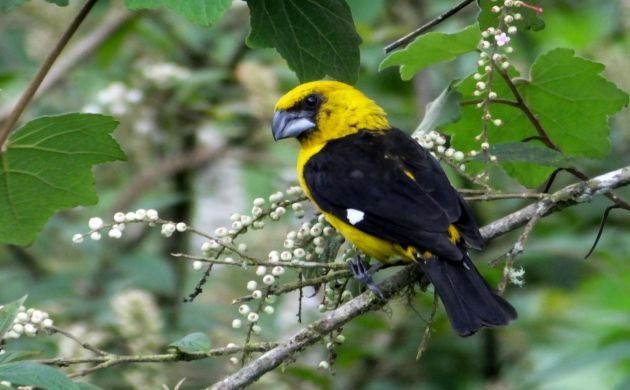 The best was a sweet Black-thighed Grosbeak. Seeing a normally skulking Chestnut-capped Brush-Finch in the open was also satisfying. 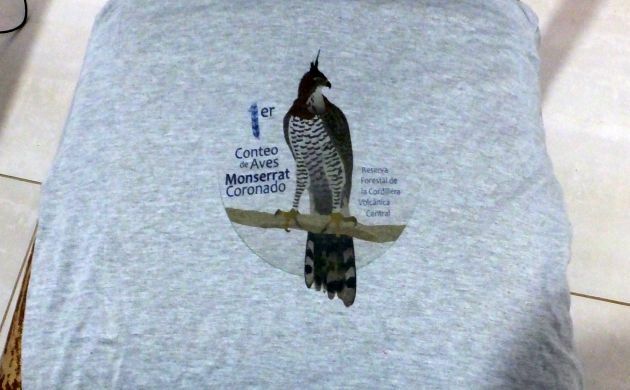 A cool count shirt– As usual, when you do a bird count in Costa Rica, you can get a cool birding shirt. I love these things! 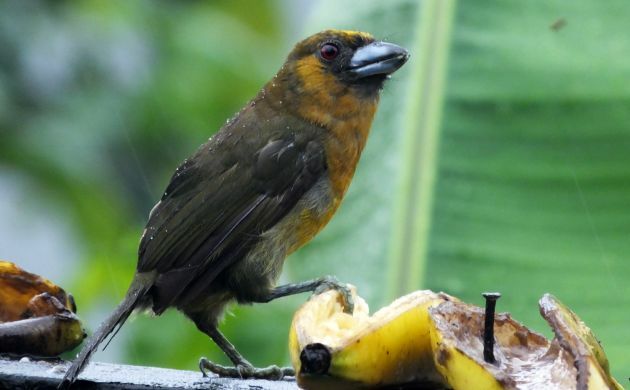 As with other counts in Costa Rica, the experience was highlighted most of all by sharing birds (as well as rain and good food) with other people who love watching birds and our natural world. If you have a four wheel drive vehicle and find yourself in San Jose with a day to spare, pay a visit to Locos por el Bosque, bird count or not, the birding is worth the trip. I always enjoy your articles and reading this one, with the multi-sensory details you include, takes me right back to Costa Rica. Thank you Patrick. @Laura- Thank you, I’m happy to hear that.